The firmware update (version 2.17) fix the PS4 Auth issue when the Dualshock 4 controller is connected into the Titan One while after the Playstation 4 started to request the device authentication. In this situation the DS4 controller does not receive the first authentication packets and, therefore, it is not able to correctly reply the subsequent authentication packets, causing the Titan One to stops working on PS4 after 10 minutes. This behavior is now fixed. Gtuner PRO 3.25 and Titan One FW 2.15 Updates. The new releases of Gtuner PRO and Titan One firmware brings improvements and adds new features. The GPC language received 3 new functions, that allow GPC scripts to monitor and reset the PS4 authentication when it is more convenient to the player. The Mad Catz Arcade FightStick Tournament Edition 2 (TE2) for Xbox One is now fully supported by the Titan One, including the RT and LT buttons. This update also adds a new option to turn off idle wireless controller, the idle timeout can be set to 5, 10, 15, 20, 30 or 60 minutes. And last but not least, bug fixes and optimizations in both Gtuner PRO and Titan One firmware. Support to XBox One controller extended report, digital LT/RT (Mad Catz TE2 Fightstick). Fix PS4_TOUCH pressing time detection. Noob playing CoD Advance Warfare on PS4 with Titan One and MaxAim DI. Call of Duty Advance Warfare online gameplay on PlayStation 4 with Keyboard and Mouse. Player with almost zero experience with CoD franchise, trained for about 2 hours before this match. Keyboard and Mouse translation made with Titan One device and MaxAim DI. Titan One unleashes the true power of your video game controller. The crossover feature allows you to use your favorite PlayStation, XBox, Wii/WiiU Controller or PC Keyboard & Mouse on the PS4, Xbox One, PS3, Xbox 360 and PC. It also converts your controller into a fully modded controller without voiding your warranty or installing any chips or wires. 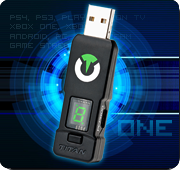 The Titan One comes with the latest Gtuner Pro software and with a library full of feature-packed Gamepacks for many of today’s popular titles. With the Gtuner Pro software plugins you can create/record/use macros and remap any button or joystick on your controller. The Visual Programming Interface and the GPC Scripting Language enable you to easily and quickly program the Titan One to your own needs. Combo Magick Plugin Update 1.85 – Touchpad! Version 1.85 adds PS4 Touchpad capturing. The Combo Magick plugin automates the creation of combo sequences by reading the controller inputs and converting this data into GPC code. The code optimization is focused in minimize the code size, but ensuring that all events are reproduced faithfully. The algorithm automatically identifies the beginning and end of the sequence of commands executed in the controller. You can include (or exclude) the data from accelerometers. Titan One Review by BitShiftTV and Win a Destiny PS4 Bundle! Thank you BitShiftTV for your honest review and opinions! We appreciated you having taken the time to produce this excellent video review. Win a Destiny PS4 Bundle plus a Titan One and Bluetooth Adapter. Comment on this blog. You can comment more than once, but only your first comment will count as an entry. Comment on the news story for an additional entry: //n4g.com/user/blogpost/cat/530931. While you’re at it, go to https://www.facebook.com/consoletunerdotcom and give a Like! 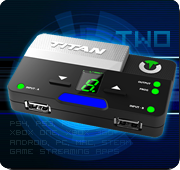 ConsoleTuner is proud to announce 3 new features and 2 new GamePacks for the Titan One device. These new features are part of their continued development and support of the Titan One device released earlier this year. In case you didn’t know, the Titan One is a hybrid controller adapter that allows gamers complete control over their input devices (game pads, steering wheels, etc) on their favorite video game console (PS4, PS3, Xbox One, Xbox 360). The Titan One allows gamers the ability to add mods (rapid fire, anti-recoil, auto reload, etc) to their OEM controller without voiding their warranty. CrossOver Controller Support, means you can use another console’s controller on your favorite console (Xbox 360 on Xbox One, PS4 on Xbox One, etc). Keyboard and Mouse, Button ReMapping, and Macro Support round out the basic features of this innovative, jack of all trades, device. Visual Programming Interface – For the first time those who are not well suited to writing code can finally create their own custom mods and features for their controllers using a visual interface. By dragging and dropping blocks on to a blank canvas, the user can create simple and complex modifications visually without writing a single line of code. This code can also be tested and programmed on to one of the 9 Titan One memory slots for use in-game or shared with the community online with the click of a button. Tournament Edition Firmware – This new firmware for the Titan One allows gamers the possibility to use their favorite controller in many local tournaments. This firmware disables all the available cheat (Macros, GamePacks, Scripts, etc) and only allows for CrossOver Controller Support and Button ReMapping. A “T” is prominently displayed on the LED readout to designate this firmware is being used. Partial PS4 CrossOver Support – Until this feature was released the only way of using another controller on your PS4 console was to connect the Titan One to a PC or laptop. With this feature that is no longer necessary. Using this feature, you can now connect your controller directly to the Titan One and your console. There is a small limitation to this feature in that it requires the controller to be automatically reconnected every 10 minutes. This reconnection takes less than 1 second and will not interfere with most game play. When this occurs the game will pause and unpause on it’s own for less than 1 second while it reconnects. It’s this reason why it’s considered partial and not full support. Full support is being worked on and will be available as a free firmware update in the future. Both GamePacks are available now and of course are free to all Titan One owners.